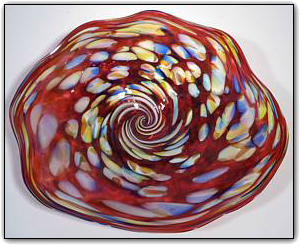 This unique wallbowl is from the End Of Day series, meaning it is made with a variety of colors used throughout the day. The colors are very deep and intense, and contain nearly every color in the rainbow. And what sets this one apart from most is its striking red background, while most other End Of Day wallbowls are over a clear background... Dirwood must have been having a lot of fun while making this one! Make sure to zoom in to see just how bright and vivid the colors are. This wall bowl can be hung on a wall just like a picture, or it can be set out as a table platter. To hang the bowl on a wall, all you need is a secure hook on the wall and a hanging apparatus comes along with the bowl. Hanging the bowl is a breeze and should take less than 10 minutes. You won't believe the compliments you are sure to receive when displaying this gorgeously colorful wall bowl!